Where Is It: 400 miles northeast of Denver, in southwestern South Dakota. It’s 277 miles west of Sioux Falls, on I-90. President Franklin Roosevelt officially proclaimed and founded the park as a national monument in 1939. It became a national park by an act of Congress in 1978. But the road to this status started well before 1939. The South Dakota legislature recognized the area as early as 1909 as one to be preserved, but it was not until two men joined forces in the 1920s that action occurred, leading to its founding. South Dakota U.S. Senator Peter Norbeck and local homesteader Ben Millard worked tirelessly and received approval to preserve the area as a national monument in 1929. Norbeck loved the artistic side of nature, was a conservationist and said he would rather be remembered as an artist than a U.S. senator. Norbeck died three years before Badlands was officially designated a national monument. Today, the Park is jointly operated by the National Park Service and the Oglala Lakota Nation. The U.S. government stripped Native Americans of much of their territory and forced them to live on reservations. In the fall and early winter of 1890, thousands of Native American followers, including many Oglala Sioux, became followers of the Indian prophet Wovoka. His vision called for the native people to dance the Ghost Dance and wear Ghost Shirts, which would be impervious to bullets. Wovoka had predicted that the white man would vanish and their hunting grounds would be restored. One of the last known Ghost Dances was conducted on Stronghold Table in the South Unit of Badlands National Park. As winter closed in, the ghost dancers returned to Pine Ridge Agency. The climax of the struggle came in late December, 1890. Headed south from the Cheyenne River, a band of Minneconjou Sioux crossed a pass in the Badlands Wall. Pursued by units of the U.S. Army, they were seeking refuge in the Pine Ridge Reservation. The band, led by Chief Big Foot, was finally overtaken by the soldiers near Wounded Knee Creek in the Reservation and ordered to camp there overnight. The troops attempted to disarm Big Foot’s band the next morning. Gunfire erupted. Before it was over, nearly three hundred Indians and thirty soldiers lay dead. The Wounded Knee Massacre was the last major clash between Plains Indians and the U.S. military until the advent of the American Indian Movement in the 1970s, most notably in the 1973 standoff at Wounded Knee, South Dakota. # Visitors: 892,372 in 2013. Peak attendance is in July; December is the low. The black-footed ferret (Mustela nigripes), also known as the American polecat or prairie dog hunter, is a species of Mustelid native to central North America. It is listed as endangered by the IUCN, because of its very small and restricted populations. First discovered by Audobon and Bachman in 1851, the species declined throughout the 20th century, primarily as a result of decreases in prairie dog populations and sylvatic plague. It was declared extinct in 1979 until Lucille Hogg’s dog brought a dead black-footed ferret to her door in Meeteetse, WY in 1981. That remnant population of a few dozen ferrets lasted there until the animals were considered extinct in the wild in 1987. However, a captive breeding program launched by the US Fish and Wildlife Service resulted in its reintroduction into eight western states and Mexico from 1991–2008. There are now over 1,000 mature, wild-born individuals in the wild across 18 populations, with four self-sustaining populations in South Dakota (two), Arizona and Wyoming. When you drive the Badlands Loop Road, you will find scenic overlooks and signs explaining some of what you see. Bring your binoculars! If you are lucky, you may spy bison or pronghorn grazing, spot a coyote stalking rodents, or perhaps catch a glimpse of bighorn sheep delicately picking their way across a steep slope. 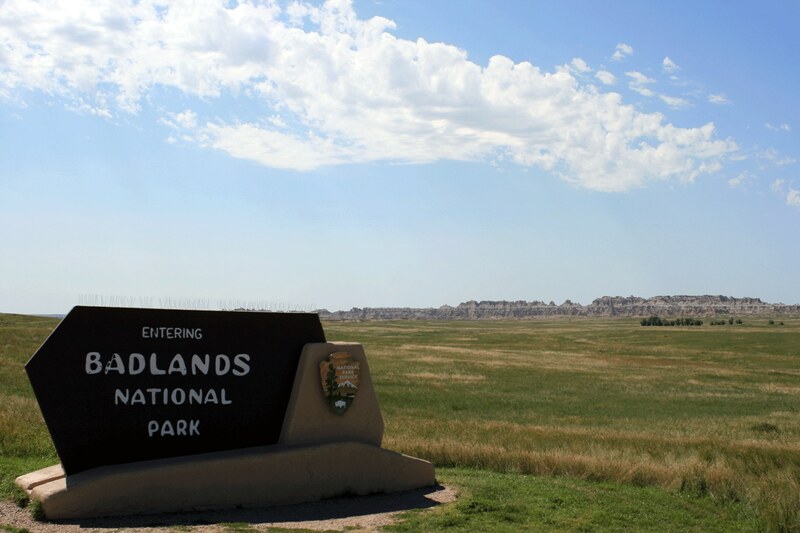 A visit to Roberts Prairie Dog Town, five miles west of the Pinnacles Entrance on the unpaved Sage Creek Rim Road, gives you a chance to visit a different “home town.” You may walk a nature trail, set off cross-country with a backpack, or attend an amphitheater program on a summer evening. The Ben Reifel Visitor Center and park headquarters are open year-round (facilities include information desk, exhibits, bookstore, and restrooms). The Cedar Pass Lodge is adjacent to the visitor center and is open during the spring, summer, and fall months. The amphitheater and the Cedar Pass campground are also within walking distance. Within five miles of the Ben Reifel Visitor Center are several trailheads, scenic overlooks, and three self-guiding nature trails. The Fossil Exhibit Trail is wheelchair accessible. The Cliff Shelf Nature Trail and the Door Trail are moderately strenuous explorations of the Badlands rock formations. A pamphlet for the Cliff Shelf Nature Trail provides a lively introduction to the wild plants and animals living among the Badlands rock formations. Fees: $15 for a 7 day vehicle pass. Staying There: Cedar Pass Lodge is the only hotel – and restaurant – in the Park. It also operates a 100+ spot campground that offers reservations – and electricity – in many spots. There is one other primitive campground in the Park, operated without reservations. Here is a great example of wildlife camouflage in the Badlands. Caught by a remote, motion activated camera, this photo shows just how well a bobcat can blend into its surroundings. Not often seen by park visitors, bobcats tend to be elusive and crepuscular, actively hunting in early morning or late evening hours. Just like a fingerprint, the coat of a bobcat is unique to each individual. From the Park’s Facebook page. We would like to congratulate former Badlands Artist in Residence Harold Nelson. This beautiful painting was his winning entry in the “Paint the Parks” show presented by the Coutts Museum of Art. Harold takes great pleasure in sharing his experience and expertise with others through sculpture and painting. From the Park’s Facebook page. Badlands in black and white, in this employee photo of the week from Ken Thompson. This picture was taken after a snowstorm in January 2014. From the Park’s Facebook page. Photo by Ranger Dakota McCoy. From the Park’s Facebook page. Baby burrowing owl. Photograph by park wildlife biologist Eddie Childers. 2012. From the Park’s Facebook page. Bison. From the Park’s website. Pronghorn Antelope. From the Park’s Facebook page. Western Painted Turtle. From the Park’s website. Western Meadowlark. From the Park’s website. Black-footed ferret. Photo by J. Michael Lockhart / USFWS. From Wikipedia.